The previous post journeyed into the brave new world of cheap USB media players and found the Incredisonic to be lacking on a couple of fronts as a GIF-looper. First, antialiasing turns the clean, straight lines of pixel graphics into mush, and second a black frame is inserted at the loop point if you convert the GIF to .mp4 or H.264 or whatever variant of the old Quicktime codec you choose. Turns out you can improve the sharpness somewhat by switching the default to a higher HDMI resolution, and also making sure your monitor is reading the HDMI as well as it can, but it's still not as sharp as a GIF can be. Most of the players in this price range are clones of the same hardware and software as the Incredisonic's, with slight tweaks to the menus and remote control configuration. The ones marketed under the names MDN and Keedox have the same issue with the black frame. Two players don't add a black frame to a looping video and have more-or-less seamless long-term play. Amazon markets one under the name Blusmart but it's also called the "MP018 full HD media player." 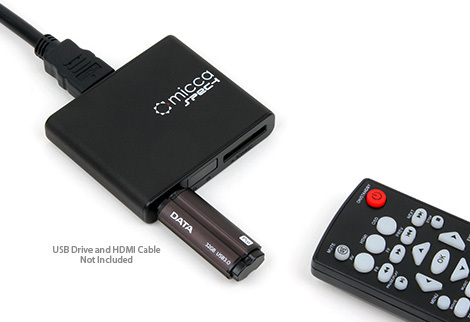 A better choice is the Micca Speck Ultra-Portable Media Player. This has no added black frame and also better design and an easier-to-use remote. Even this one, though, employs some of the same basic software layout and wording as the other players. And it plays GIFs at half-speed if you load them as "photos" rather than exported-to-video. Am curious how these features are licensed around and which Chinese company came up with the original clunky design. All these devices handle most common media files, including VOB so you can transfer DVD content to the player with no loss of quality. But these are still poor ways to show GIFs, so, if you want to do that for "fine art display" reasons you either need to (i) spend about $200 on the Windows versions of the Mac Mini, or (ii) accept that it's no longer a GIF but rather some sort of weird lo-fi compressed video animation that may have charms of its own. Some GIFs that don't need to be particularly sharp will look perfectly fine on these little players, but either way, you no longer need the extra step of burning a DVD (but then what are you going to sell? that's another post).